I’m writing this on the 13th birthday of a good friend of Jana’s. Happy birthday, Christine! I was present at the birth of Christine and her siblings, and was lucky enough to work with one of Christine’s sisters for several months. She was very smart and went on to work at a facility for children who have been removed from their homes. Anyhow, back to Christine. She’s been the best friend and companion of a good friend of mine since the day she was born. Christine’s mom lived with another good friend until she passed away a few years ago. Christine, Jana, and I, along with an ever-changing supporting cast that now includes Cali, have spent many mornings at the beach at Crissy Field in San Francisco. 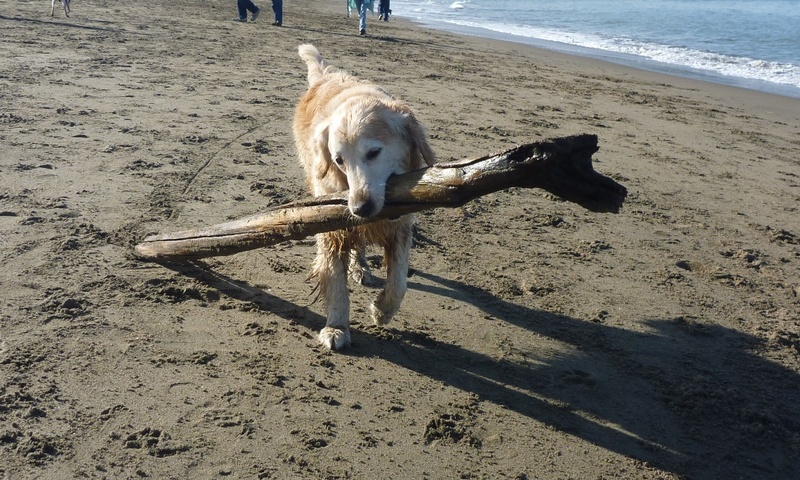 Christina likes to find the biggest stick on the beach and then carry it all the way down the beach. That is a better beach habit than Jana’s — rolling in the sand over and over, to make sure that several pounds of sand are stuck all over her body. Like Jana, who is only a few months younger, Christine is showing her age. She’s having a harder time walking, so we haven’t had a girls’ beach day in a while. I’m thinking about Christine today and also about Leti, a good friend of Jana’s and mine who was a regular visitor at the park where we play each morning. I just found out that Leti, who was 15, passed away recently. My enduring image of her, as she enters the park and is released from her leash, is of an obviously happy golden bounding across the grass. She and Jana used to tag team the people at the park, begging for treats. I’ll miss her a lot … she was such a sweet and happy girl. I hope Jana is as happy and playful when she’s 15. A couple of my local friends volunteer at a senior dog sanctuary, Lily’s Legacy. I’d love to get involved, but I’m afraid to. Their website is full of photos of elderly golden retrievers, and I am afraid I would scoop them all up and take them home. Two dogs more than fill my small apartment with toys and fur! Happy birthday, Christine … and hugs to all the wonderful senior dogs out there! Love this! Christine looks like she’s carrying something that belonged to Fred Flinstone!